Upgrade any event with a Phoenix party bus! Say goodbye to the average party and greet a whole new way to celebrate! Party in style, in a fun filled atmosphere, within a safe and comfortable environment kept up-to-date with modern sound equipment and room for tons of exciting activities. We provide a party bus Phoenix can always rely on to have an amazing time! 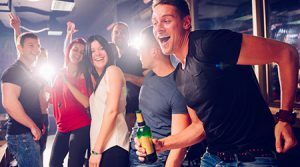 The party bus is the perfect environment for fun social gatherings as it’s suitable for small groups as low as 14, all the way up to 55 passengers. Great for birthdays, holiday parties, bachelor and bachelorette celebrations, prom, and much more. Every party bus comes fully equipped with everything you need to get a party started. Discover instant fun as you turn up the state-of-the art professional sound system with bass booster, easy to operate—all you have to do is plug in your phone and hit play. Guests can relax, or get involved with a local game on the large flat screen TV or take a spin on the dance floor. Turn up the heat and try your dance moves on the dance pole! Save yourself and your guests money by selecting our full bar option and have drinks any way you want them without paying $11 for each drink at a local club. Need a party bus near me? Look no further! You can rely on our service to be professional, reliable, and affordable. Is this party bus for teens? Have no worry parents! The party bus is becoming a popular option for pre and post prom parties as it promotes safety—keeping everyone and their friends in one safe place. Parents can have peace of mind knowing no additional stops will be provided until final drop off. Our attentive chauffeurs attend to your schedule needs, so you can decide when you want your child home. We can provide the best party limo Phoenix has ever known when it comes to dependability, safety, and a fun time!